Have you ever wondered why bass-range instruments tend to lay down musical rhythms, while instruments with a higher pitch often handle the melody? According to new research from Laurel Trainor and colleagues at the McMaster Institute for Music and The Mind, this is no accident, but rather a result of the physiology of hearing. In other words, when the bass is loud and rock solid, we have an easier time following along to the rhythm of a song. During the experiment, Trainor's team played people high and low pitched tones at the same time. The tones were repeated in a sequence. They found that that the brain was better at detecting when the lower tone occurred 50 MS too soon compared to when the higher tone occurred 50 MS too soon. 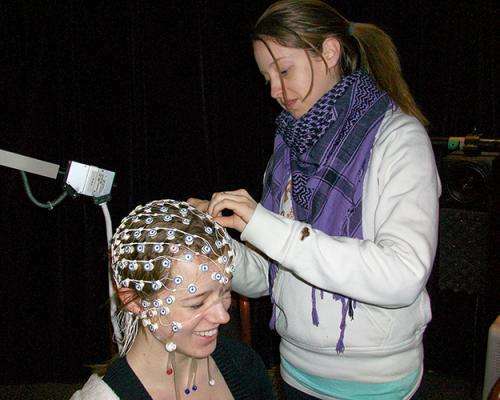 They measured electroencephalography (EEG) by placing sensors on the head and measuring electrical activity from the brain in response to the sounds. When an unexpected sound occurs—such as a tone that is earlier than it is expected to be—the brain response contains a spike referred to as the mismatch negativity, otherwise known as MMN. The MMN was larger when the lower tones were early compared to when the higher tones were early. The researchers also found that when a different group of subjects tapped their fingers to these rhythms, they changed their tapping more in response to when the low tones were early, compared to when the high tones were early. Finally, the researchers played their sounds through a computer model of the ear whose output represents the neural firing patterns in the auditory nerve. They found that the auditory nerve responded more to the timing errors of the lower-pitched tones than to the errors of the higher-pitched tones. This suggests that the effect arises right in the ear. These results explain why in musical systems around the world—from East Indian raga music to Indonesian gamelan music—the rhythm is carried in the lower-pitched instruments. The findings were published Monday in the Proceedings of the National Academy of Sciences.